The Clinton-Massie girls bowling team, overall champions of the SBAAC American Division, from left to right, Ashley Gross, Lindsey Amberger, Abbey Faucett, Emily Rager, Jenn Callewaert, Abby Schneider. The Wilmington High School girls bowling team, champions of the SBAAC American Division tournament, from left to right, McKenzie Frazier, Savannah Cox, Alexia Frazier, Nicole Gallion, Haylee Wright, Cassidy Cole, Ariel Comburger, coach Joe Gigandet. 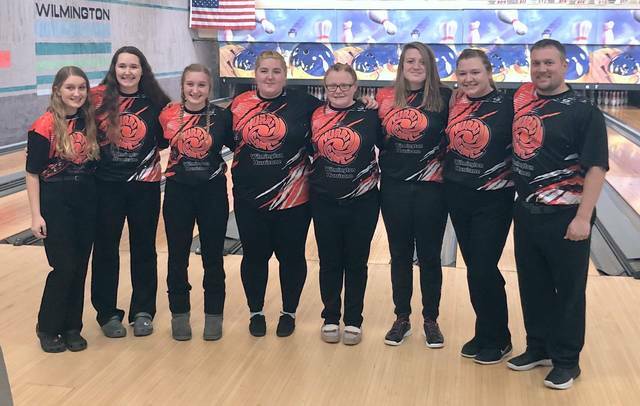 WILMINGTON – It was a good day for the Wilmington and Clinton-Massie girls bowling teams Saturday at the SBAAC American Division tournament at Royal Z Lanes. The Lady Hurricane were tournament champions while the Lady Falcons, led by Ashley Gross, claimed the overall American Division championship. The Lady Hurricane finished with a 2,592 total to win the tournament. Ariel Comburger led WHS with a tournament runnerup series of 524 while Haylee Wright came through with a 480, sixth best at the event. Gross, though, was atop the field with a 546, which included a 213 game. As a team, the Lady Falcons tied with Batavia for second in the tournament. But that finish was good enough to edge Wilmington for the overall American Division championship. The title, though, is unofficial as their is still a match to be contested in the league. However the match will not have a bearing on the top four places in the league standings. https://www.wnewsj.com/wp-content/uploads/sites/22/2019/02/web1_BWL_cmgirls_champs.jpgThe Clinton-Massie girls bowling team, overall champions of the SBAAC American Division, from left to right, Ashley Gross, Lindsey Amberger, Abbey Faucett, Emily Rager, Jenn Callewaert, Abby Schneider. 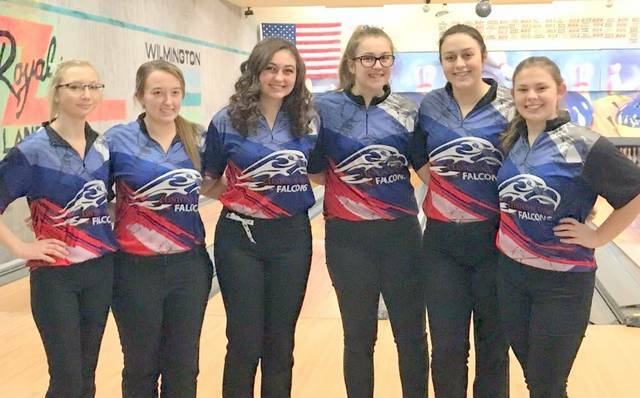 https://www.wnewsj.com/wp-content/uploads/sites/22/2019/02/web1_BWL_wilm_girlstourneychamps.jpgThe Wilmington High School girls bowling team, champions of the SBAAC American Division tournament, from left to right, McKenzie Frazier, Savannah Cox, Alexia Frazier, Nicole Gallion, Haylee Wright, Cassidy Cole, Ariel Comburger, coach Joe Gigandet.